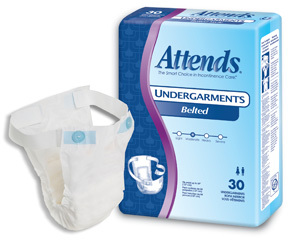 Attends Undergarments® Belted Style are an everyday, unisex choice that offer individuals the option to be worn with or without underwear and the ability to be changed without fully removing your pants. Belted style with wide, comfortable, reusable belts. Leg gathers and contoured shape for leakage protection and form-fitting comfort. Soft, cloth-like inner liner is gentle against the skin. Poly outer covering prevents leakage. Triple-tier moisture locking system (pH-reducing fibers, microporous acquisition layer, super absorbent polymer) for exponential improvements in absorbency, skin health and odor control.